When you brew good beer, you're unlikely to be short of friends. So it follows that if you've been brewing good beer for 18 years, you should be pretty darn popular. 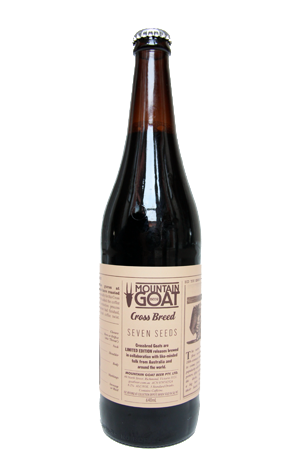 Certainly, Mountain Goat – which turns 18 in just a few weeks – has never struggled to find people with whom to collaborate, from musicians such as Henry Wagons and international brewers like Brooklyn and Mikkeller to their mates at Seven Seeds. Co-owner Dave Bonighton goes waaaay back with the coffee roaster's co-owner Mark Dundon, a friendship that led to 2011's first Seedy Goat, a coffee IPA that captured the perfume like green bean character of coffee in a hoppy, US inspired IPA. Now they're back in cahoots with a rather different – more traditional, one might say – coffee beer. It's a coffee porter for which Seven Seeds provided coffee sourced from the El Desarrollo farmers group in Huila, Colombia, a collective of 82 small farmers who produce "super premium micro lots". We're told that, once brewed, the coffee displays "brown sugar and bitter orange character". Inside this beer, it makes taking a sniff from your glass akin to the first opening of a fresh bag of coffee beans and the coffee flavour sticks around throughout the beer without being overbearing. There's lots of chocolate to keep the roast company in a beer that's well balanced by unobtrusive hops and light on its feet for 6 percent plus. In fact, it shares the power of drinkability with stablemate Surefoot so, even though it comes in longnecks, one might not be enough.